"The rooms were cleaned &well stocked." 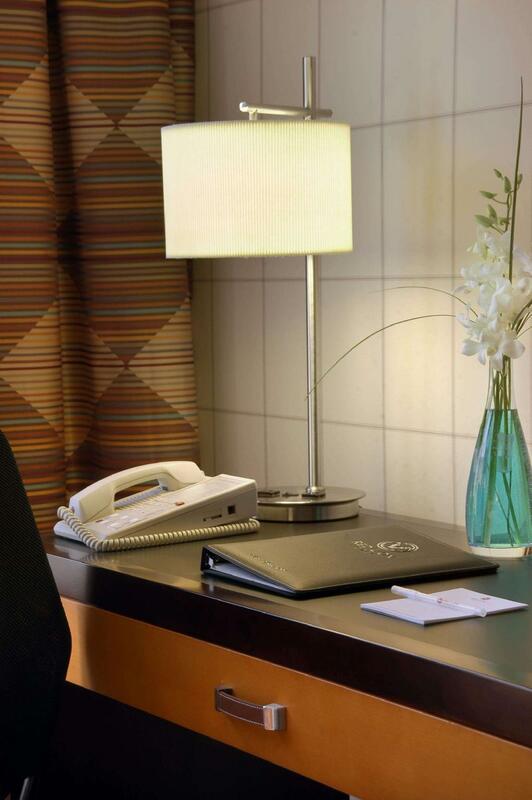 "When we check in, the staff was very very helpful and very understanding!" "We will definitely come back for our next trip to Disneyland." "The staff were polite and helpful." 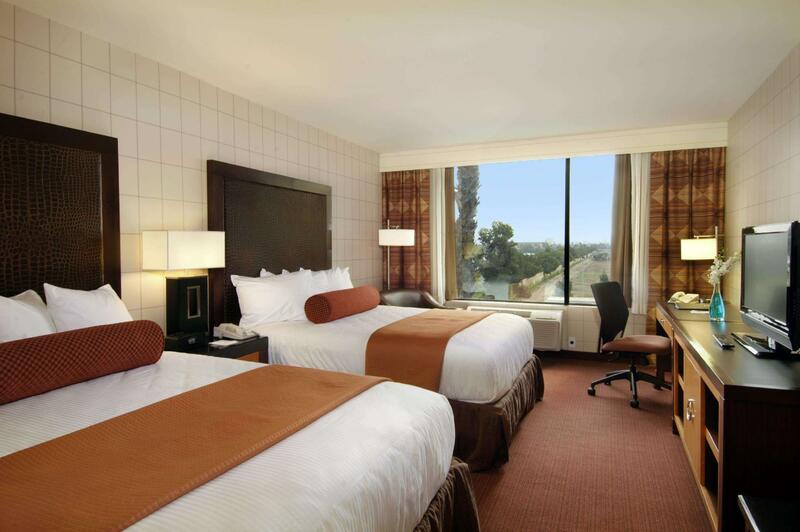 Located in Anaheim, California, just 10 minutes’ walk from Disneyland, this hotel offers on-site dining and a heated outdoor pool. A gym is located on site. All guest rooms include free WiFi. 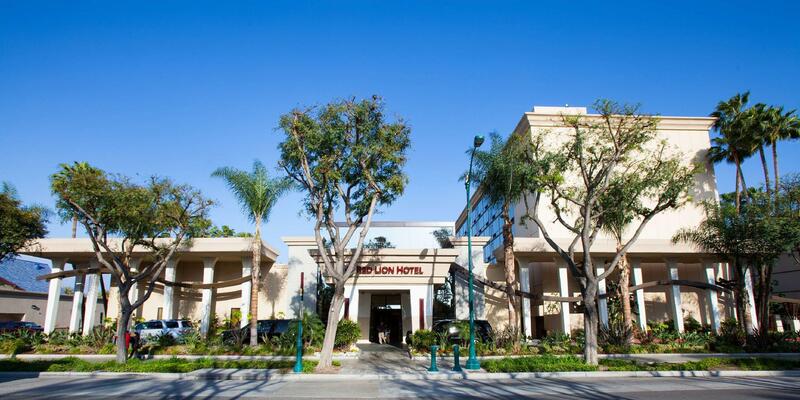 All accommodations at Red Lion Hotel Anaheim feature a flat-screen TV with satellite. Each comfortably furnished room is equipped with a fridge and microwave. Tea and coffee making facilities are included. At Anaheim Red Lion Hotel, Red’s Pasta Kitchen serves up contemporary Italian fare. Cocktails and appetizers are available. Café’2Go offers a fast and hot menu for guests short on time. 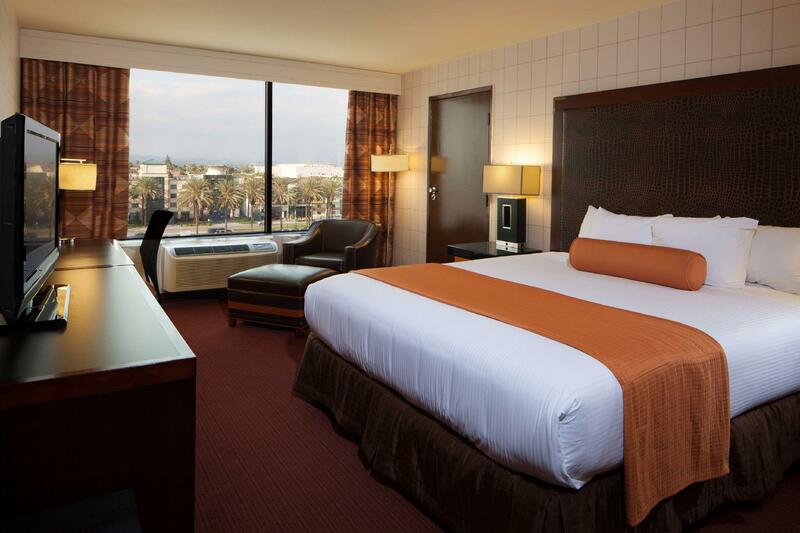 Anaheim Convention Center is 8 minutes’ walk from this hotel. Knott's Berry Farm is 14.9 km away. "The front desk, Johny, were very patient with us and told us..."
Please note: Breakfast-Included rates are for 2 guests only. Additional guests may purchase breakfast. Guests will be charged a Resort Fee of USD 14.95. Guests are required to show a photo identification and credit card upon check-in. Please note that all Special Requests are subject to availability and additional charges may apply. Pros: distance to Disney, able to see fireworks from the windows. Cons: heater noise, toilet flushing and shower , and bed spring sounds from neighbors; and hidden fee(resort fee) that is known only when booked. I wouldn't go back to the same place. if you factor the hidden fee, the difference becomes small. I would spend a little more money to stay at a stress-free place. Though closeness to Disney is a big benefit. This hotel has the best service. We had family member who arrived at a different time, so we called in ahead to let them check-in, just to found out that we had some booking problems. The front desk, Johny, were very patient with us and told us everything/steps we need to do. Initially, we had to call to the websites to fix our issues. We told “Johny” that we’re driving from Las Vegas to LA and cannot call the websites. He was really understanding and figure it all out for us ! Best front desk we ever had ! He had saved us hours on phone calls.When we check in, the staff was very very helpful and very understanding! We asked a lot of questions and they always smile! We will definitely come back for our next trip to Disneyland. Pros- reasonably close to Disneyland, lovely staff. Cons- not any better than a cheaper motel, pool area not toddler friendly, charged 40$ resort fee for a place that is def not a resort. Breakfast is very basic and you have to pay extra for it. overall was good but they still not yet refund for me after two weeks. Stayed here for a 3 day Disneyland trip over Memorial Day Weekend. Originally was given a room on the 2nd floor facing north that we were told faced Disneyland & we would be able to see the fireworks. Funny thing was the window only had a view of a wall & A/C duct. We were quickly & gladly given a different room that faced S. Harbor Blvd. Otherwise our stay was great. The staff were polite and helpful. The rooms were cleaned &well stocked. The pool is heated & has its own towels. The continental breakfast was good, plus this dining area serves reasonably priced & tasty appetizers & meals during the day as well. Be aware you will be charged a Resort Tax. This hotel is on the opposite corner from California Adventure and is within walking distance from the park entrance. However, I’d recommend to do your feet a favor & buy a ART pass (Anaheim’s bus system) that picks you up in front of the Hotel every 20-30 minutes & takes you directly to & from the park as much as you desire. Te piden un cargo segun para garantizar algun daño, prometiendote de reembolsarte el total (40 dlls con tarjeta o 100 dlls cash) y al realizar el check Out, te salen con la sorpresa de que te cobraran los servicios del hotel, cuando ni siquiera tome el agua del cuarto. y no te reenbolsan el dinero completo. 주변이 전부 디즈니 리조트 관련 호텔이라 그런지 밤 12시에도 돌아다녀도 안전하다고 느낄 정도였습니다. 디즈니 파크가 자정까지 운영해서 뽕 뽑느라...어쩔 수 없었음ㅋㅋ 근처 다운타운 디즈니는 새벽2시까지도 운영하는 상점이 많아서 놀기 좋았네요~. 또 호텔 코앞에 IHOP같은 다이너도 있고, CVS와 월그린이 경쟁업체마냥 마주보고있어서 아침에 먹을 샌드위치나 야식을 사기에도 아주 적절했습니다~! Location was center of everything we need. I will revisit the hotel when I come back for Disneyland next year.